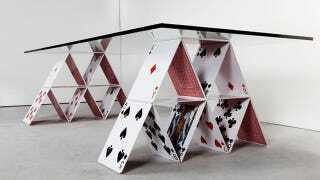 How can this—very real—table support that thick glass when it is held just by two houses of cards? MAGIC, that's how. Magic and the fact that the cards are laser cut from 4mm-thick steel.